Made for a friend who is due in a few months. She requested a vest - I provided! She had a similar shaped dress from H&M that just suited her so well so I made a slightly larger version as the original was getting a bit small. She saw me doing the bow embroidery on the bodice and requested some dogs too that she'd seen in one of my embroidery books! I like the embroidery though - I see a few dresses with embroidery in the future in the Etsy shop. 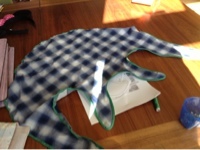 My little Kapor was featured in a really cool 'Monster' treasury over on Etsy - thanks Amanda! Sewing down some bias binding today around the edge of one of the toddler aprons while Oliver is up for his nap. A little case whipped up quickly for my new iPad mini, as we're heading off for a few days and I don't want it getting damaged. I used some Cath Kidston fabric and some plain, thin fleece on the inside. 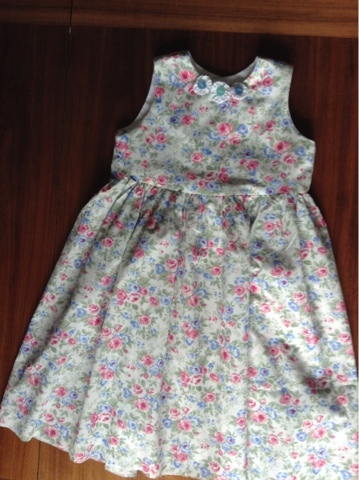 A dress for a 3-4 yr old. Just needs a zip put in the back and the hem finished. Simple, but nice for the summer, I think!